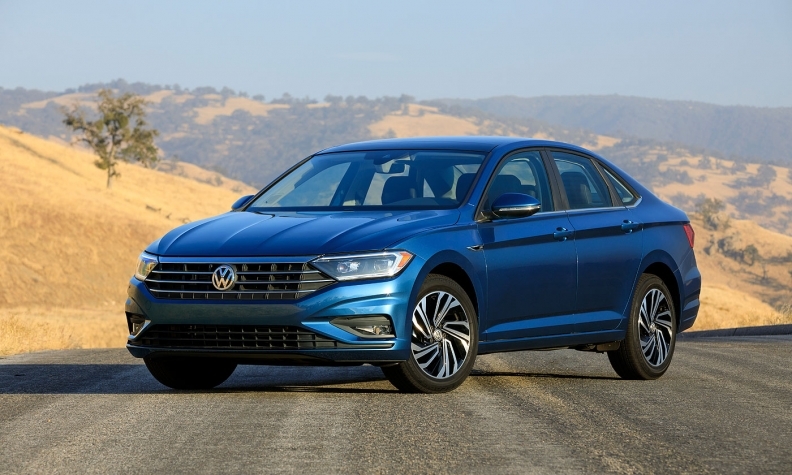 DETROIT -- Volkswagen's redesigned 2019 Jetta sedan will be larger than the outgoing version and receive an injection of safety and infotainment technology as it moves to the automaker's global MQB platform. The latest Jetta, due in U.S. dealerships in the second quarter and introduced Sunday at the Detroit auto show, will gain 33 millimetres (1.3 inches) in its wheelbase, and will be longer, wider and taller than the outgoing version, adding interior space to the compact sedan, which is the automaker's top seller in the United States and second-best seller — behind the Golf — in Canada. LED lighting will be standard on the revamped Jetta, which will gain a bolder look with more accentuated styling lines. The previous sedan's 147-hp 1.4-litre turbocharged engine will be carried over, but mated to a six-speed manual or optional eight-speed automatic transmission, providing up to 184 pound-feet of torque. Models with automatic transmissions will come standard with a start-stop system to improve fuel economy. Pricing for the 2019 Volkswagen Jetta hasn’t been announced in Canada, yet. It starts at US $19,395 including delivery in the United States. The starting price is US$100 less than the outgoing model there. Inside the cabin, the 2019 Jetta will feature a cockpit similar to that of the Euro-spec redesigned Golf, including Volkswagen's optional Car-Net infotainment system, compatible with Apple CarPlay, Android Auto and MirrorLink smartphone integration apps. In the United States, the Jetta's top two trim levels, SEL and SEL Premium, will come standard with the automaker's Digital Cockpit display, allowing for a reconfigurable display of data, including navigation, on the instrument cluster. Also optional will be heated and ventilated seats, dual-zone climate controls and 10-colour customizable wraparound ambient lighting. At five-litres in volume, the redesigned centre console will be large enough to hold a standard-sized iPad. On the safety front, the 2019 Jetta will have a standard rearview camera, as well as a suite of available collision avoidance and other safety-related systems. They include autonomous emergency braking; blind-spot monitoring with an added function that alerts the driver to a vehicle approaching the Jetta's blind spot; adaptive cruise control, improved for use in stop-and-go traffic; lane-departure warning; and automated high-beam control. The 2019 Jetta will come in four trim levels in the United States: S, SE, SEL and SEL Premium, and will come standard with the automaker's six-year/72,000-mile transferrable bumper-to-bumper warranty. Volkswagen Canada didn't say how many trim levels will be available in Canada. VW says it will introduce an R-Line trim level closer to launch that will feature sportier styling, exclusive interior and exterior design elements, special badging and an improved electronic differential. Pricing for the 2019 Jetta was not announced. Volkswagen sold 115,807 Jettas in the United States in 2017, off 4.4 per cent from the previous year, including a worrisome 45 per cent decline in December volume. In Canada, the automaker sold 17,483 Jettas in 2017, down 16.5 per cent from the year before.